A variety of Accommodations to Meet Any Need. When was the last time you got away? When you arrived there were you met with southern hospitality and treated like you were a guest in someone’s home? 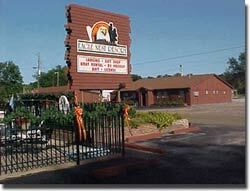 Well, welcome to Eagle Nest Resort on Reelfoot Lake, Tennessee. We will provide you with the cleanest facilities on the lake and maid service each day. You must read about our lodging accommodations and make your reservations soon! Pick out the perfect place for you, your friends, and family to stay below! Give us a call for prices on our lodging options! If you are looking for a private and breathtaking view all in one, we have just the place for you. Our Hunter and Fisherman Haven is located right on the water’s edge, with your own fishing access, and access to the swimming pool (when in season)! What more could you ask for all in one place? And it accommodates from 2-16 people, perfect for that special couple, groups of hunters, fishermen, family reunions or nature watchers. You must check out this beautiful house, so make your reservations today! 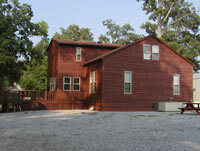 If you are looking for something to accommodate 1-4 people, the rooms at our main lodge will be perfect for you. We have rooms available with 2 double beds, single beds, bunk beds and kitchenettes upon request. These rooms are located on the edge of the lake so you can watch the beautiful sun set while fishing from the pier, or while feeding the ducks. Get ready to spend a little time relaxing in our clubhouses. 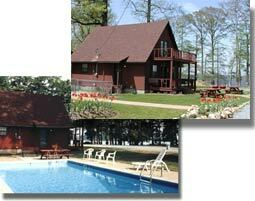 Located within walking distance of the lake, these accommodations provide complete comfort, making it feel like home. 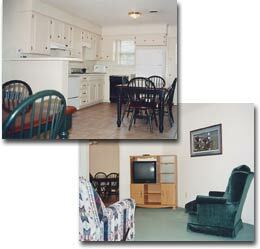 The clubhouses can accommodate groups of 16 people or more, since these units adjoin for “togetherness”. Relax and escape the “real world” on your private deck, where you can grill out or swap fishing and hunting stories. If you're looking for a private and breathtaking view all in one, we have just the place for you. Our Hunter and Fisherman Haven is located right on the water’s edge, with your own fishing access, and access to the swimming pool (when in season)! What more could you ask for all in one place? And it accommodates from 2-16 people, perfect for that special couple, groups of hunters, fishermen, family reunions or nature watchers. You must check out this beautiful house, so make your reservations today! We've also just added a second Cabin right next door! Call us today for additional details! Copyright © 2019 Eagle Nest Resort. All Rights Reserved. Design by EMS Creative.